23 April 2019: April and May are the busiest times of the year in the lab! 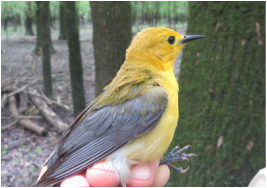 First, congratulations go out to lab alumnus Morgan Slevin (and Alix Matthews and Lesley Bulluck) for publication of his second chapter of his MS thesis that documents spatial variation in color in Prothonotary Warblers across two ecologically dissimilar sites. Read it here. 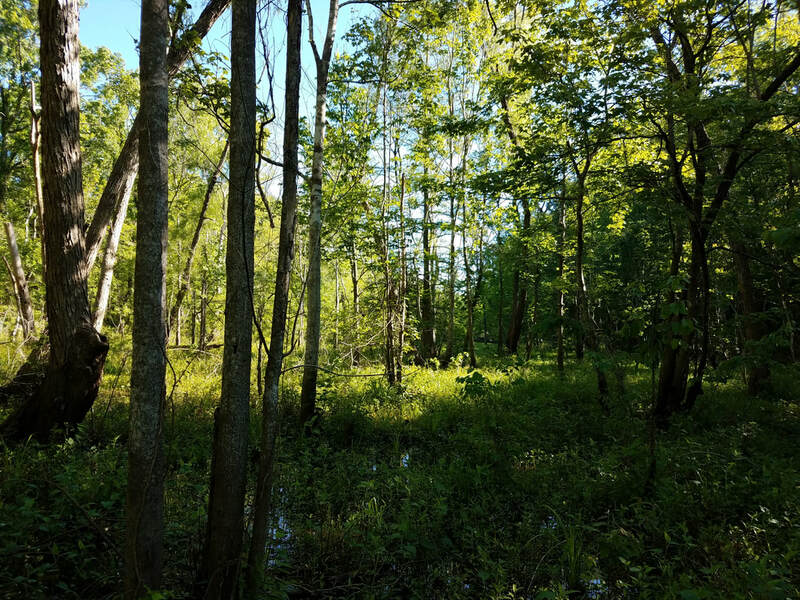 Also, congrats to Kevin Krajcir who successfully defended his thesis proposal and started his field work (in the swamps of the Atchafalaya basin, see photos). Jacob Wessels (Buffalo River) and Joe Youtz (in the Upper Lower Delta) have also started their final seasons of field work, and last but not least, Alix Matthews has decided to come back to our lab to work on her PhD (starting in August)! Very excited to have her back. 2 April 2019: Exciting week in the lab. 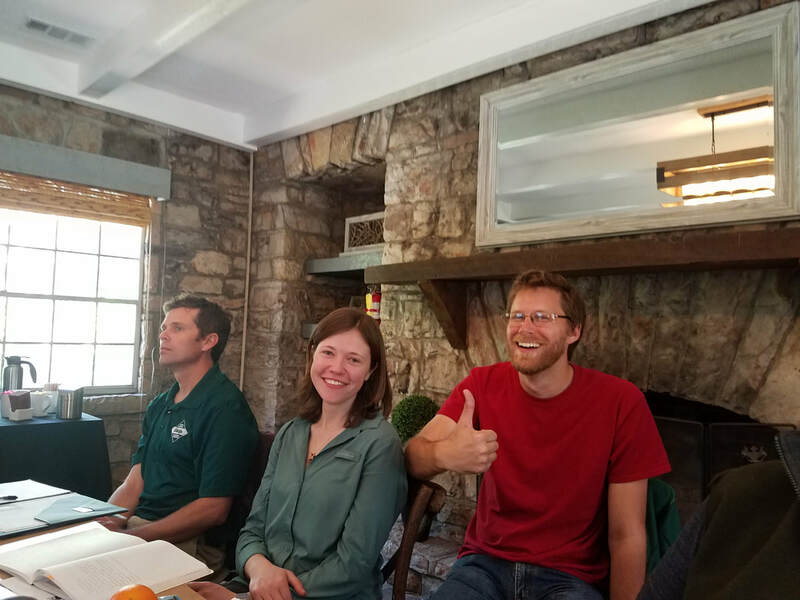 Em Donahue and I (along with lab alumus Alex Worm) attended the Loggerhead Shrike Working Group meeting in Birmingham, AL, where we presented our latest research on shrikes in the LMAV; Jacob Wessels received the Bergstrom Award from AFO for his research on Cerulean Warblers; and our collaboration on Prothonotary Warblers resulted in another great publication (lead author Matt DeSaix), this time in Molecular Ecology. Read it here! 15 March 2019: Had a great trip to Little Rock last week for state Wildlife Society Meeting. Congratulations to Em Donahue, who won the award for best student presentation, and Joe Youtz, who took home 2nd place! Breeding field seasons just around the corner....BAWW, CERW PROW, and NOPA coming back soon! 7 December 2018: Shrike season is back in full swing! We have found some new and exciting prey items. Here are a couple of the new lunch items: a little brown skink and a shrew. Also shown is one of our new birds (Master Worm) that we caught with seminar speaker Dr. Bobby Fokidis (from Rollins College). 1 November 2018: Lots of stuff happening in the lab! First, congratulations to lab alumnus and general crazy man, Alex Worm, for his first lead-author publication. Based on his MS thesis research, this paper documents and characterizes hybridization patterns between two range-expanding species (Scissor-tailed Flycatcher and Western Kingbird) and is in production in the Ibis at this moment! Check it out here. 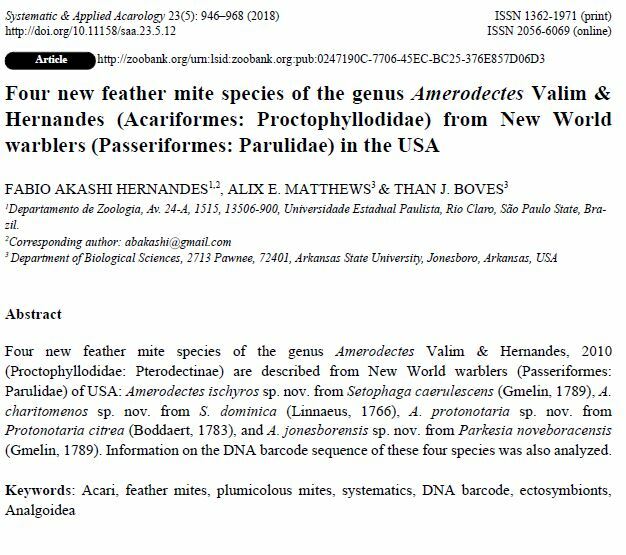 Second, we (Alex Worm and I) presented our research recently at the Memphis Chapter of the Tennessee Ornithological Society (on this same topic) and I went to Fayetteville to present our feather mite research at the University of Arkansas biology seminar series. Thanks to JD Willson and his lab for inviting me and showing me my first (somewhat embarrassingly) LeConte's Sparrow and Speckled Kingsnake as Woolsey Wet Prairie. Joe Youtz also presented our research on fragmented woodlots in the Mississippi Delta at The Wildlife Society meeting in Cleveland. Finally, we will have two field projects going this winter. We will be continuing our shrike work AND we are starting a new exciting project: installing barn owl and kestrel boxes in ag fields in the area and then monitoring them for occupancy. Eventually, the goal is get farmers to use these native species as pest control (to hopefully replace at least some pesticide application). We are building boxes now and will start putting them up soon! 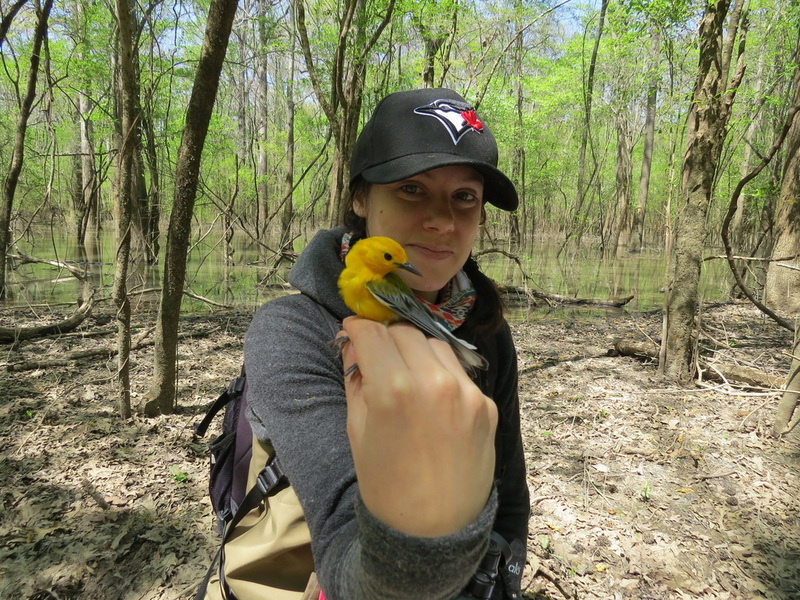 14 August 2018: A new publication in Avian Conservation & Ecology about Prothonotary Warblers in Arkansas based on the Master's thesis research of Morgan Slevin. Congratulations Morgan (and Alix Matthews)! 1) Congratulations to Lee Bryant for winning the Alexander Wilson best student presentation award at the WOS-AFO meeting in Chattanooga and for getting her first publication! 2) Congratulations to Alex Worm for winning the M.S. Biology student of the year award! 3) Our manuscript (with Alix Matthews and Fabio Hernandes) describing four new species of feather mites on warblers (inc. one named for Jonesboro) was published in Systematic and Applied Acarology. 4) Traveled from Louisiana to Idaho catching warblers and collecting mites. Over 300 birds (and some ridiculous number of mites) captured! 3 May 2018: Greatly honored to become an Elective Member of the American Ornithological Society. Joining an amazing group of scientists. Couldn't have made it this far without many mentors, students, and collaborators! Thanks to all! 18 Apr 2018: We have had a busy past month and a half! Highlights include: Em Donahue and I went to the Loggerhead Shrike Working Group meeting in Nashville, TN where we shared our research and discussed future directions; Em and Lee Bryant did a great job presenting their research at the American Ornithological Society meeting in Tucson, AZ (from what I hear! ); Jacob Wessels and Joe Youtz successfully defended their MS thesis research proposals (and both have started their 1st field seasons); we are starting to look for returning Cerulean Warblers carrying geolocators in the Ozarks; and finally, we have begun to catch warblers for our pilot study of geographic variation in the relationships between warblers and their feather mites! Going to be a busy couple of months as we travel from Louisiana to Idaho catching (and collecting mites from) American Redstarts, Common Yellowthroats, Prothonotary Warblers, Northern Parulas, Cerulean Warblers, Black-and-White Warblers, and Yellow Warblers! 5 Mar 2018: Our lab went to the Arkansas Chapter of The Wildlife Society meeting last week and Lee Bryant and Em Donahue presented their research. Em Donahue won second place in the student presentation competition. Congratulations Em! 20 Feb 2018: Check out the cool video of how we capture Loggerhead Shrikes. Thanks to Em Donahue for this footage. 14 Feb 2018: It's been a busy winter chasing shrikes and planning for upcoming spring projects, so haven't posted too much. BUT here is a video of a really cool encounter between a shrike and an EARLY garter snake. Of course the shrike won! 19 Dec 2017: Hot of the presses, our accepted paper exploring co-evolution between feather mites and warblers. Congratulations again to Alix Matthews and Doug Raybuck, as well as our other co-authors, for their exceptional work. 24 Nov 2017: It's been an exciting month in the lab, with lots of congratulations in order. First, at beginning of the month Alex Worm defended his thesis on range expansion and hybridization of Scissor-tailed Flycatchers and Western Kingbirds successfully. Congrats, Gusanito. Second, lab alum Alix Matthews finally had her her first thesis chapter accepted in the journal Ecology and Evolution. Congrats to her and all of our co-authors! 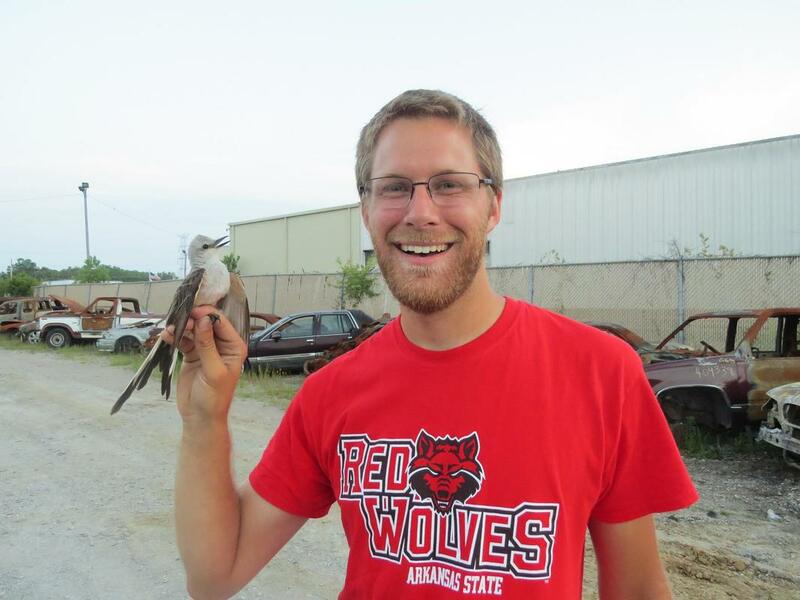 Finally, congrats to Jacob Wessels for receiving the Eulalia Araoz Memorial Award from the Arkansas Audubon Society for his proposal to study Cerulean Warblers (including the first to study female movements) in the Ozarks. Joe Youtz and Emily Donahue also received awards from AAS. Great work everyone! 19 Oct 2017: Congratulations to Jen Wilcox for successfully defending her thesis on forest management for birds in the LMAV! She has come a long way and we are all very proud of her accomplishments so far. Hopefully a couple of publications are coming up next! 29 Sep 2017: Congratulations to both old and new lab members. First to alum Doug Raybuck for publishing not one, but two, papers (in Journal of Field Ornithology on Golden-winged Warbler migration and in The Condor responding to a critique of our Cerulean warbler effects of geolocators paper). Second, to newbie Joe Youtz for giving his first conference talk about Dusky Grouse at the TWS meeting in Albuquerque, NM. Well done to both! The Condor paper is still in production, but will post it when available. 15 Aug 2017: Had a great time at the inaugural AOS/SCO meeting in East Lansing, MI! Lab alumni, Doug Raybuck and Alix Matthews, both gave great talks about their M.S. thesis research. Good seeing old and new colleagues and friends as well. 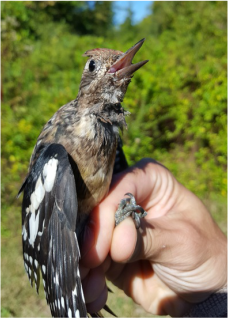 21 June 2017: Very pleased to announce that the paper, "Continent-wide analysis of how urbanization affects bird-window collision mortality in North America", has been accepted for publication in Biological Conservation! This article is the fruition of many years of work by many people, both in our lab at AState (many undergraduates and graduate students helped survey campus buildings for window-kills) and many other institutions across North America. A special congratulations to Steve Hager and Brad Cosentino for leading this effort. Read the press release here. 8 June 2017: Congratulations to incoming lab members, Emily Donahue, Joe Youtz, and Jacob Wessels for receiving the Upper Delta Region Biodiversity Scholarship! Great start to your careers at AState. 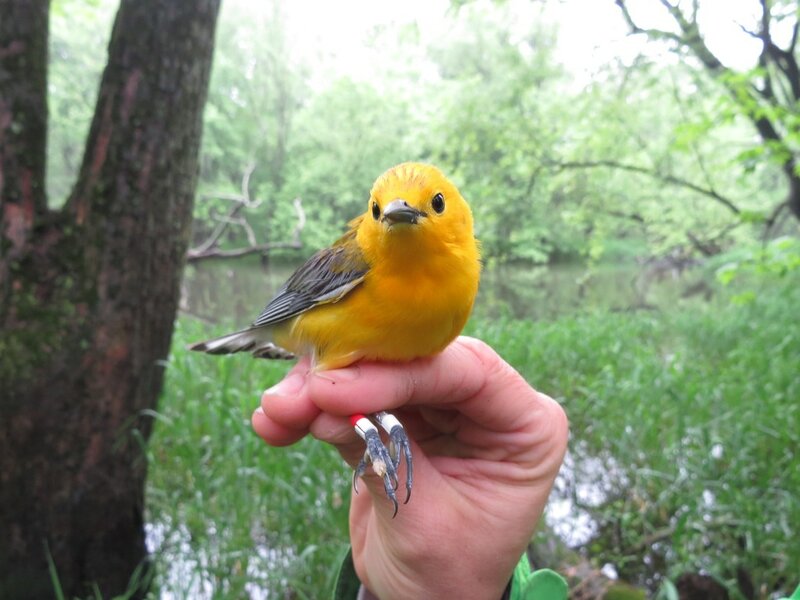 29 May 2017: Prothonotary Warblers with geolocators recaptured along the Sugar River in southern Wisconsin. Six birds recaptured so far. Here is one; good ol' Skunk Baxter. So smooth. 15 May 2017: Cerulean Warbler geolocator paper getting alot of media attention! 11 May 2017: Catching Cerulean Warblers in the Ozarks with the crew. Thanks to Ammar Taqi for the photos! 21 April 2017: Congratulations to Lee Bryant (and Hopscotch) for her first publication! 'Male Louisiana Waterthrush (Parkesia motacilla) successfully defends nest from juvenile black rat snake (Elaphe obsoleta)' in press at Wilson Journal of Ornithology. And congratulations to Alix Matthews, who won the award for the Top M.S. Student in Biological Sciences. Well-deserved! 30 March 2017: Congratulations (again) to Alix Matthews for accepting the offer to work on the genetics of leaf-cutter ants (and their fungal gardens) with Jon Seal at UT-Tyler! 13 March 2017: Congratulations to Alix Matthews on successfully defending her M.S. thesis research on feather mite ecology and evolution! And check out these awesome Prothonotary Warbler cookies! 27 February 2017: Cerulean warblers outfitted with geolocators in Colombia! 2 February 2017: Some cool photos of Loggerhead Shrikes heading into our traps. Thanks to Cole Harken for the GoPro images! 30 January 2017: Congratulations to Morgan Slevin on successfully presenting his M.S. thesis research. Almost done! Next stop Borneo, to find nests with Dr. Tom Martin and crew. Jealous. Great job and best of luck! 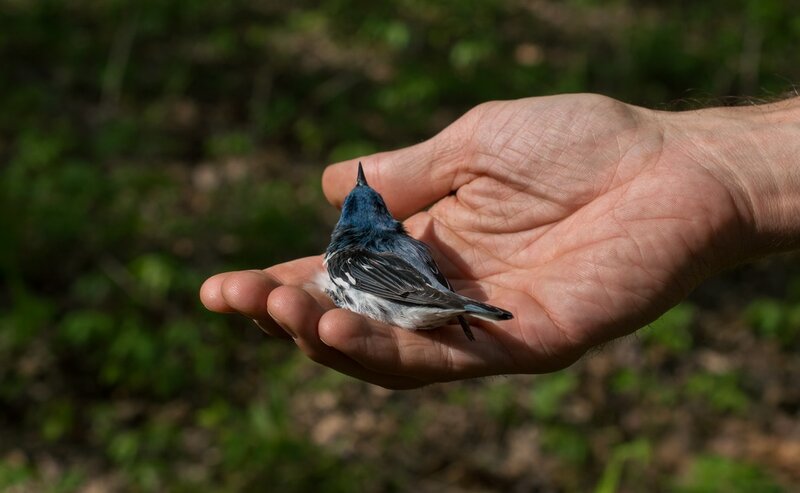 7 December 2016: Meet Elmer (Pancake), one of our Pennsylvania Cerulean Warblers, and the threats that he faces across his annual cycle. 14 November 2016: Loggerhead Shrike surveys are up and running (in collaboration with Michael Collins and students at Rhodes College). Today, we found our first larder of the season (poor Ribbon Snake)! 31 October 2016: Congratulations to Doug Raybuck for a successful defense of his Master's thesis! Good luck on your next adventure as a PhD student at the University of Tennessee! 7 October 2016: New papers from the lab accepted (female song in PROW in Ibis) and published (Feather CORT and carry-over effects in Conservation Physiology)! Congrats and great work Alix, Morgan, and Alex! 29 September 2016: The Arkansas State Bird Observatory is up and running! Another great bird meeting in the books. The entire lab attended NAOC VI in Washington, D.C. this past week (along with almost 2000 others) and we presented 8 papers! Everyone did a great job, but special congratulations to Morgan Slevin for his honorable mention for best student paper. I assume she was able to get away from the bear, but I was unable to resight her. Three other nests suffered the same fate. Pretty amazing how strong those bears are; they bent that conduit like it was nothing. Put out 22 geolocators along the beautiful Sugar River in Rock County. Looking forward to finding who comes back next spring! After hearing several females "singing" an unusual, ascending, buzzy "song" over the past few years, we finally got video (not the best) and good sound recordings of a female Prothonotary Warbler vocalizing at White River National Wildlife Refuge. We also caught the female (at right). She seemed to be attempting to get the attention of a male that already had nestlings (with a different female). 10 April 2016: PROW come back to White River with geolocators! Morgan received a 2nd place award for best graduate oral presentation. Well done! 1 April 2016: Lee Bryant receives TWO more grants to fund her LOWA/Hemlock research! Congratulations to Lee for receiving the Bergstrom Award from AFO and a grant from the Tennessee Ornithological Society! Her acknowledgements section is going to be unwieldy! 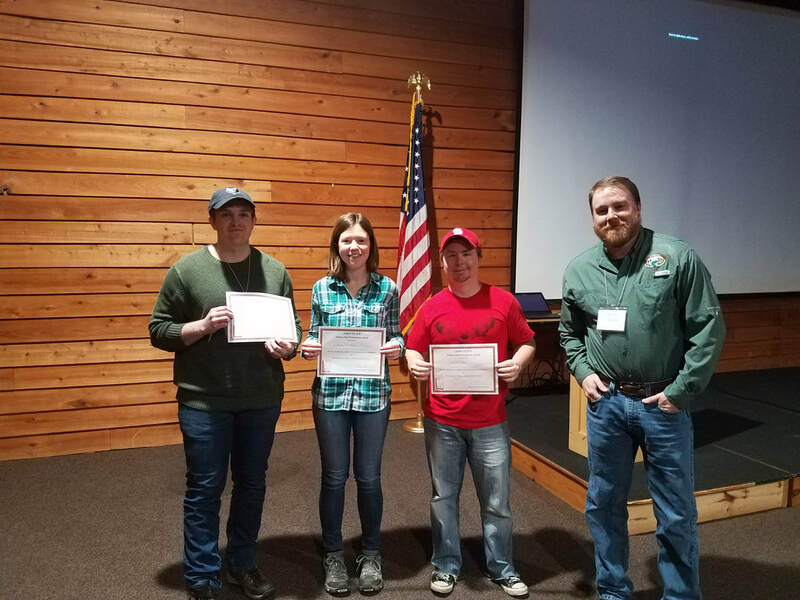 All six grad students in the lab presented talks at the AR TWS meeting and Alix Matthews (1st place) and Lee Bryant (2nd place) won best student presentation awards. Well done guys. Also, congratulations to fellow A-Staters Chris Thigpen, Cole Harken, Hunter Adams, and Karen Wright on their championship quiz bowl team (and to Sam Schratz for his 3rd place student presentation). 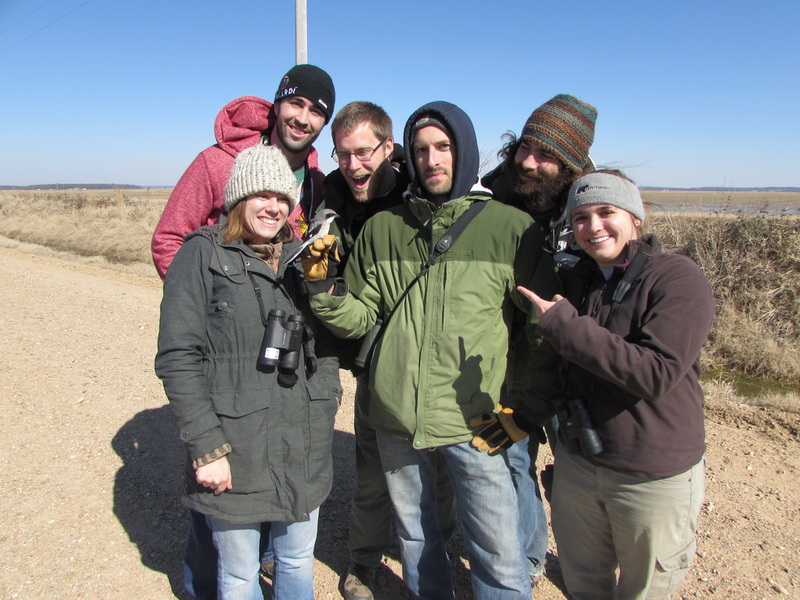 11 February 2016: Lab captures our first Arkansas Loggerhead Shrike! With Dr. Mike Butler by our side, we captured Larry the LOSH using a bow net and mouse. Also found his larder! Congrats again to Lee - she raised over $2000 for her research! 18 November 2015: Congrats to Lee (again) for another successful grant application! Lee Bryant received $778 from the Arkansas Audubon Society to support her research on LOWA and hemlock decline! Had a great week in Lafayette, LA meeting with the PROW working group, presenting posters and talks, and shrike trapping at SE-PIF. Meanwhile, Doug Raybuck presented at the Natural Areas Conference in Little Rock, AR and won the best student presentation. Congratulations Doug! 9 September 2015: Congratulations to Lee Bryant on her first successful grant application! 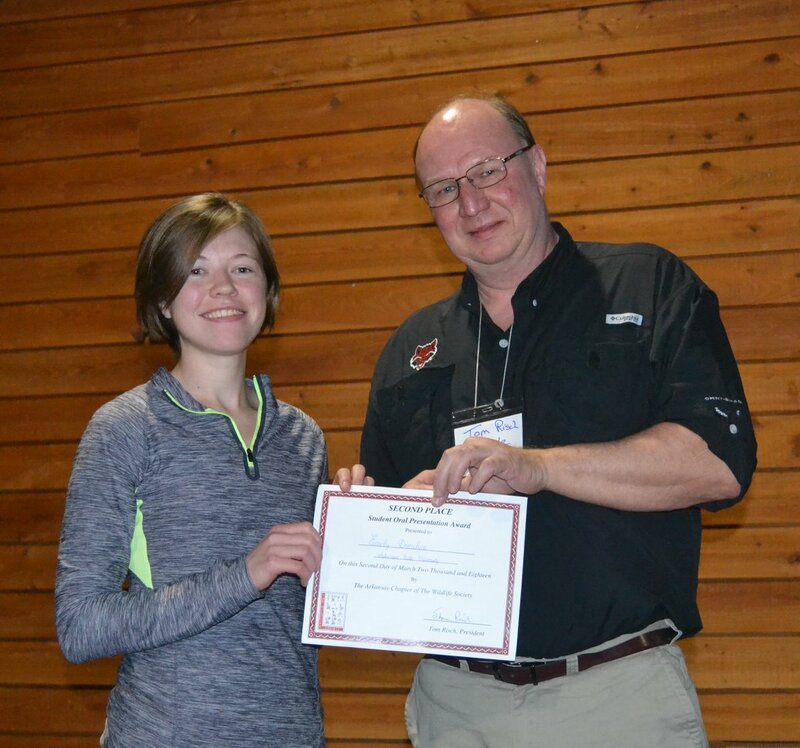 Lee received $750 from the Knoxville Chapter of the Tennessee Ornithological Society for her research on the effects of hemlock decline on Louisiana Waterthrush in the Great Smoky Mountains National Park! 25 August 2015: Publication in PNAS by lab member Alix Matthews! Five posters presented from the lab! 60 STFL on the way down! 71 on the way back; good work guys! Alex Worm and I caught this kiddo after a wild chase around President's Island in Memphis. Cause of deformity is currently unknown but we have collected blood to examine genetics (assessing hybridization with STFL) and possibly environmental contaminants. Other two fledgies looked fine. 8 July 2015: First student-led Boves lab paper accepted at WJO! Congrats to Morgan and Doug! Still learning how to do this!